What did our forefathers do for fun in winter? Well, they raced, of course. They built ice boats and raced them against each other . . . against motorcycles . . . and against trains. Trains - you say? Yes, trains. According to the Icicle (yacht) article in Wikipedia, In 1871 "Icicle" beat the "Chicago Express" train on a run between Poughkeepsie and Ossining. 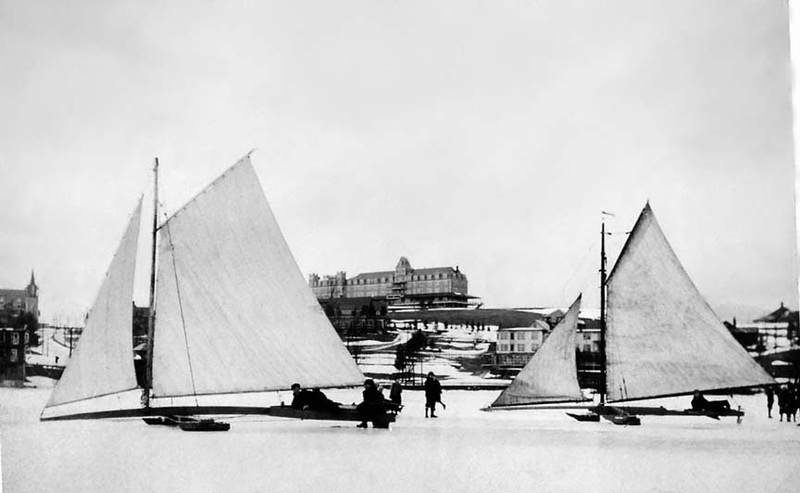 Early ice yacht clubs spent most of their time racing trains. 140 yrs later, the Icicle still holds the world record for largest yacht ever built according to the Guinness Book of Records. Although I don't have an image of the Icicle, I have 2 images which show a race between an ice boat and a motorcycle which took place on Toronto Bay during the Titanic era. The first image has the date of 1912? written across the bottom. 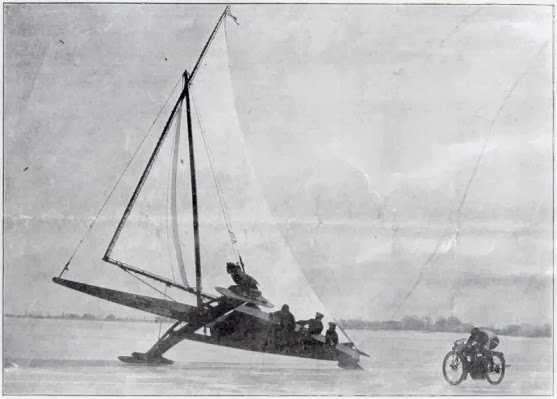 1911 Ice Boat vs Motorcycle Race, Toronto Bay, Ontario. Courtesy City of Toronto Archives. The next image is from the Canadian Heritage Gallery and has the caption: Ice boat and motorcycle on Toronto Bay, March 1911. 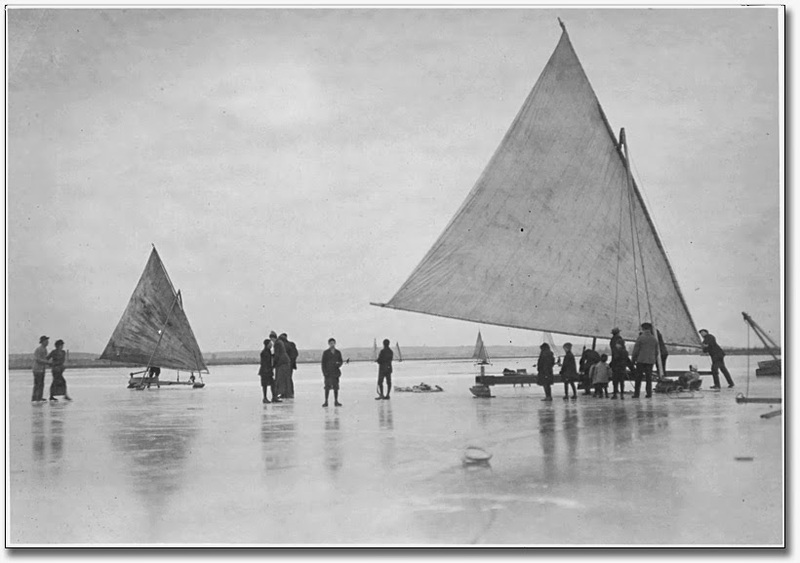 Billed as the "Mile a Minute Race" and reaching speeds up to 100 kilometres per hour, the crew of the ice boat Comet included the brothers who built it, Carol C. Wells and Samuel R. Wells. Also in the boat are Malcolm Cuthbertson, Frank Kerr, and William Self. On the motorcycle is Canadian motorcycling champion Herb Kipp. 1911 Ice Boat vs Motorcycle Race, Toronto Bay, Ontario. Courtesy of Canadian Heritage Gallery. Considering the question mark dating the first image, I believe both the above 2 photos are from the same race, but with different views. Check the Canadian Heritage Gallery if you wish to buy a copy of this image. This next image shows men transporting lumber on an ice boat. Curious, I did a bit of research and found another wikipedia page whick acknowledges that although ice boats have always been used for racing, they were also used in the late 19th century for the transportation of goods. It goes on to say . 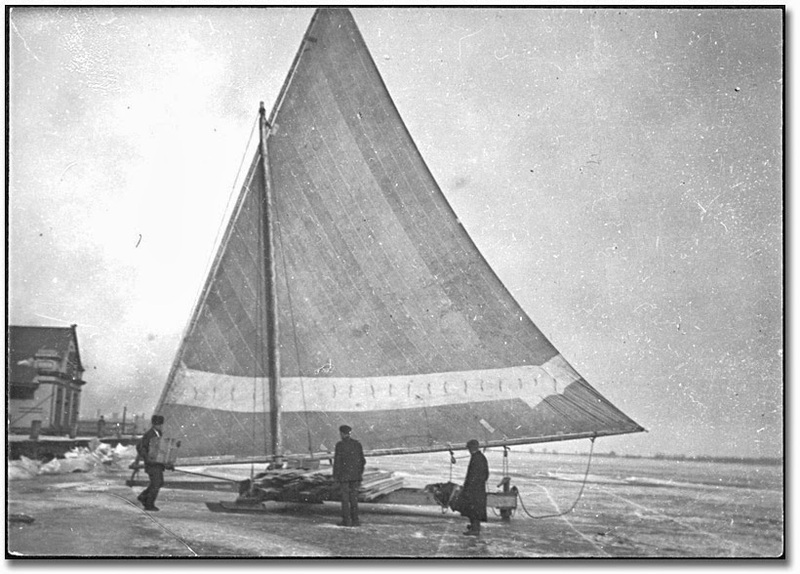 . . One unique type of ice boat has its history in wide, stubby, scow-like vessels used in the 1800s, often for transportation across a mixed passage transitioning over sea-ice and open water. Wildly sailed by adjusting main and jib sail trim only, these boats had no rudder. Parallel rails were mounted on the bottom, like multiple sled runners. These early vessels (called an "ice scooter" or "bay scooter") were capable of simultaneously and daringly traversing both open water and jumping onto stretches of ice and were used primarily for winter transportation to and from lighthouses and for ice fishing. 189? Ice Boat loaded with lumber by John Boyd. Courtesy Archives of Ontario. The thought of racing across the ice and open water sounds hair-raising. It also ties in with the reason ice sailing isn't as prevalent across North America as other winter sports - you need a specific type of ice - black ice - the type drivers dread finding on the road. But for ice sailing, the black ice is smooth and clear with no snow to impede the runners and through the driver off course. (Or would that be a sailor?) The far north then, doesn't have the required ice because it's freezes too fast with a crusty, rough surface. Neither is it safe where freezing doesn't create a consistent layer thick enough to support the weight. Ideally, the North American "ice belt" is approximately 40°N latitude to 45°-50°N latitude where it gets cold enough to freeze water to several inches thick before being covered with snow. 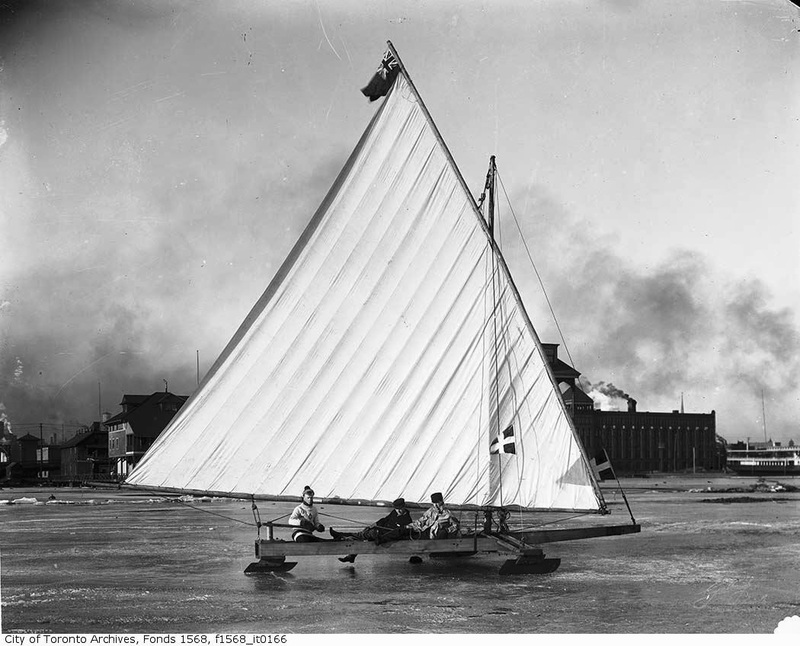 1907 Ice Boat on Toronto Harbour, Ontario. Courtesy City of Toronto Archives. If you think you'd like to build your own, Popular Mechanics published plans for a Speedy Iceboat - Seats Four - December 1931, Popular Mechanics. However, plans can also be found in books and magazines pertaining to wooden boats. 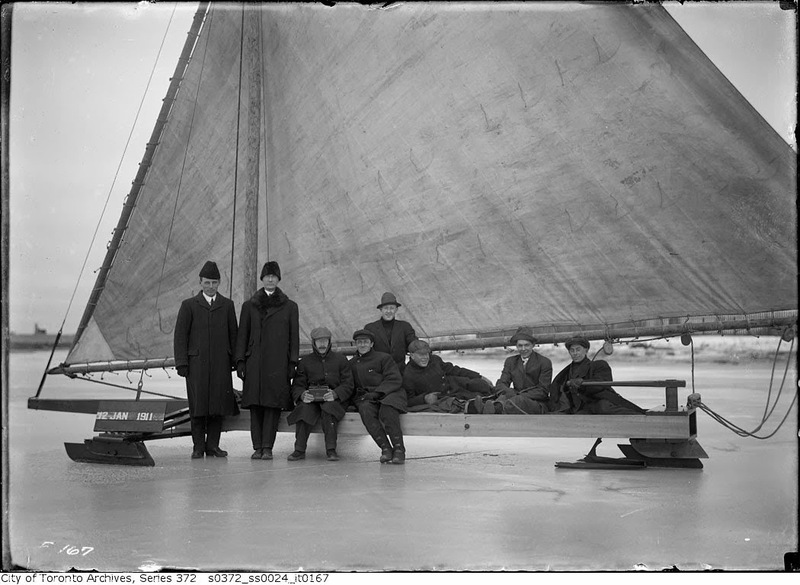 1912 Ice Sailing on Toronto Harbour by Jack Boyd. Courtesy Archives of Ontario. This next photo of Toronto's Department of Public Works shows how the Engineering Staff gets across Toronto Bay in the winter. 12 Jan 1911, Dept of Public Works Engineering Staff. City of Toronto Archives. Although most of these photographs are from Ontario, I found this next one while looking at the old photos on the site for the Lake Placid Library. 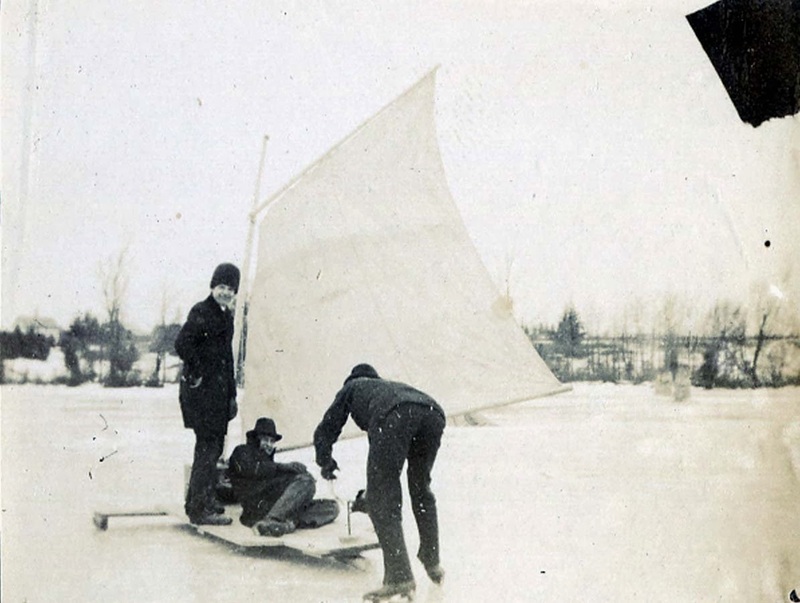 1915 Ice Sailing. From the Mary Mackenzie Collection of the Lake Placid Library. Do you see the difference between the Lake Placid ice boats and the Canadian ones? 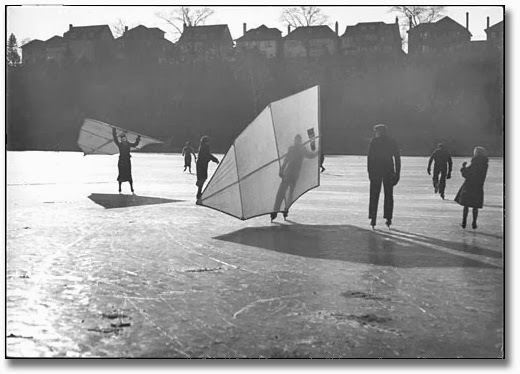 This next image isn't about ice boating at all, but what the caption reads as skate sailing. Are these skate sailers what we call wind surfers today? Or do all wind surfers stand on boards? Finally, I have a set of two photos from the Oshawa, Ontario. The write-up from the Oshawa Public Library Archives states they are four young men, but honestly, a couple of them appear older than that. That's good, because I like that everyone has fun with the ice boats. 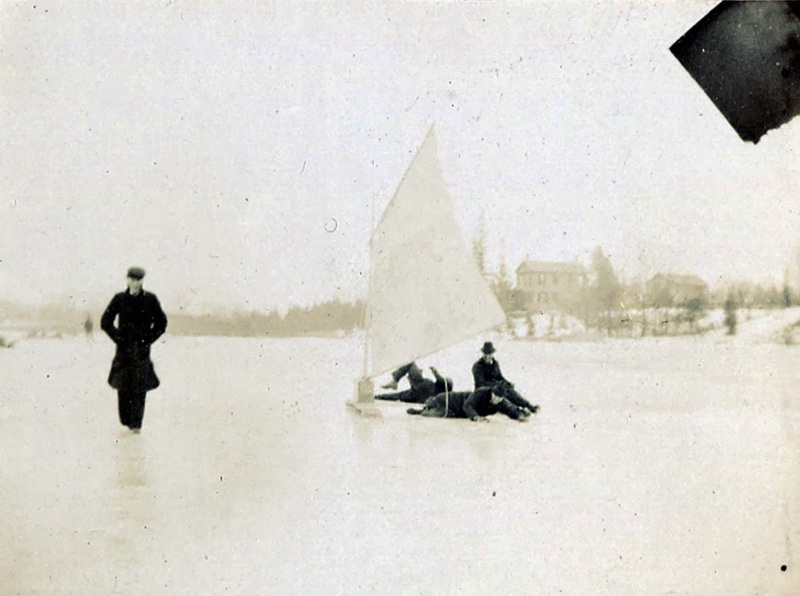 1900-1910 Ice Boating on South Pond. Courtesy of the Oshawa Public Library. Whoops! One of the hazards of playing on the ice. If you're interesting in racing ice boats, a quick google search will bring up sites in several provinces and states which hold competitons throughout the season. Who's waiting for ice sailing/boating/yachting to become an Olympic Demonstration Sport? 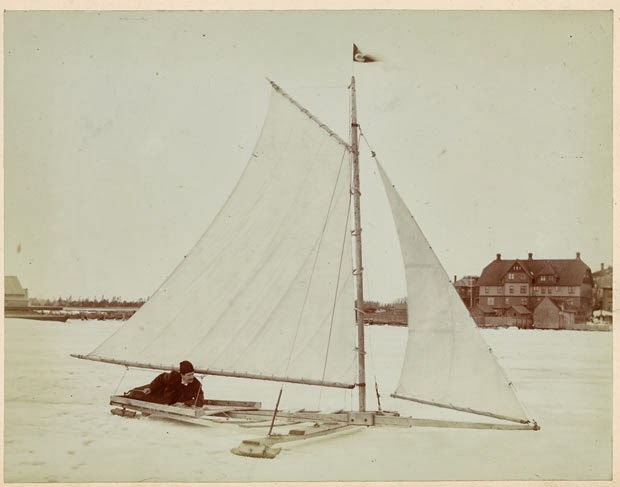 Ice sailing sled rigged for racing on the ice of the Hillsborough River, Charlottetown, Prince Edward island. Courtesy of PublicArchives and Records Office of Prince Edward Island Acc3218/189. 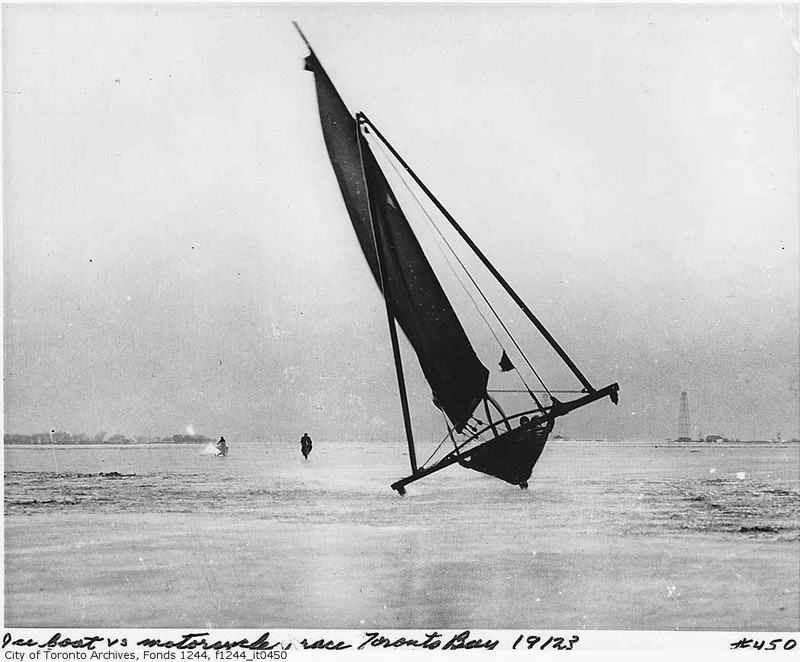 There are several videos on the net showing ice boats, competitions, and crashes, but unfortunately, none are historic. Most of them didn't appeal to me because the music track, or quick change images, didn't allow me to feel the adventure. At first, I didn't watch this one that I'm adding here because I don't like seeing people get hurt, but something about the cover image pulled me in... and now I'm very glad I watched it because to me, this is the ultimate video gives the ultimate natural feel of what it's like being in a modern ice racing boat. good point about the ice. It can be so rough where snow has melted or it's windy. But the idea of switching from gliding across water and ice both is frightening. I see that Lake Placid boats were more maneuverable (two sails) and would be a lot of fun to see racing! I'll need to look into that a bit more. I have seen small ice boats like these ' in person' but not in action. Wind surfers do stand on a long surf board looking contraption and the "mast" is on a pivot that moves all around by use of a bar control (I have one- no I don't use it) but I think I would have tried the skate- sail in a very light breeze! Deb, you continue to amaze me. I never imagined you for a wind surfer - wouldn't your Regency gown throw you off course or something? Ha! Thank you for explaining the purpose of the 2nd sail, and how wind surfing works. Sailing is not my thing although I love watching anything with a sail slice through the water or across the ice. I had no idea they did this. Hockey? Really, DeAnna? I had no clue you were interested in hockey. Actually, I think it's nice of you to look forward to CANADA WINNING THE GOLD IN HOCKEY! Yeah, we'll see. Not that Canada couldn't ice two full teams with the best players in the NHL. Point taken... and this Olympics we have a very young team, so we'll see how they hold up under the stress of the Big O. This looks so fun! 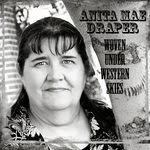 I love it, Anita. I never knew about this! Suzie, I didn't find any photos of ice sailing in any of the BC archives, so I'm assuming the west coast doesn't have the right ice for it. I even checked the interior lakes, but if they do it, they're hiding the fact. I think the closest I found to your location was Ghost Lake, Alberta, and I have to admit, I have no idea there was a Ghost Lake in Alberta until now. I didn't know there was a Ghost Lake, either, Anita. Sounds like a setting for a suspense novel! As for the ice around here, I don't imagine it would ever be thick enough for ice sailing. Although, I have seen a few brave souls drive their cars onto a frozen lake. Not the smartest thing to do around here, that's for sure! Yep, I hear you on the Ghost Lake idea. Not my cup of tea, though. You find the most interesting things, Anita! I'm surprised ice sailing hasn't made it down this direction. We do have a lake where people go out and race their cars on the ice, and ice fishing is very popular, and we certainly have enough wind! Hmmm... an idea for a new sporting attraction/money-making venture? The paddle boards that have become so popular in the last few years here (where you stand on the board and paddle along with an oar) rent for $100 an hour. More if you want a lesson to go with it. I wonder how hard it would be to find an ice sailing boat??? Niki, the first time I saw the paddle boats live was when Suzie and I took a Balboa Beach boat tour while at RWA 2012 Anaheim. Personally, I can't see the value in it. You can't go fast enough to have a thrill - unless you're out there for the wakes, and then other boats probably slow down or stay clear of you. And I'd be too busy trying to balance and steer to get any decent photographs. I loved that day, Anita. It was one of the highlights of that trip for me. Paddle boats are lovely for a day of relaxation. My son and I used to take the paddle boat out in the cove, with our lunch, and we'd spend the day out there just relaxing and watching the seals following us around. So interesting. I never knew about this! I always learn from your posts, and you have the best pictures to go with them. I'd rather kayak. In nice, temperate, unfrozen water, on a warm, sunshiny day. Just sayin'. I've never kayaked, but I like canoeing and rowing. Every time I think of kayaking, I imagine myself upside down in the water trying to get myself upright and unable to do so. It must come from my deep seated fear of almost being drowned when I was around 9. That was no fun at all.